Trim down stalk to fit your largest roasting pan, keeping the fullest, most uniform portion of the stalk intact. Remove sprouts from trimmed part of the stalk. Heat stock to a simmer in small sauce pan. Place stalk on rack in roasting pan. 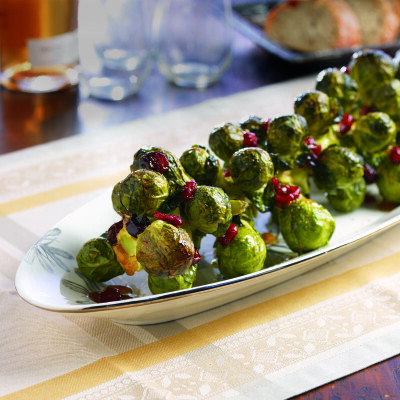 Add sprouts that have been removed from trimmed part of the stalk by placing them in between attached sprouts. Pour stock into pan, cover, and place in oven, allowing stalk to steam for twenty minutes. If your roasting pan does not have a lid, tent with heavy-weight aluminum foil. Place maple syrup and olive oil in mason jar with tight-fitting lid. Shake to emulsify. When sprouts are done steaming, remove pan from oven and carefully remove cover. Brush syrup mixture over sprouts, season with salt and pepper, and return to oven to roast uncovered for about 45 minutes, basting every fifteen minutes with pan drippings, until slightly brown and fully cooked. If you notice that the pan drippings are starting to dry up or burn, add a little more water to the pan 1/2 cup at a time. Remove from oven and place stalk on serving platter. Remove roasting rack from pan and add dried cranberries to pan drippings. Set roasting pan on stove top over low heat and simmer for five minutes, allowing drippings to reduce and cranberries to plump. Pour remaining pan drippings and cranberries over roasted stalk and serve.